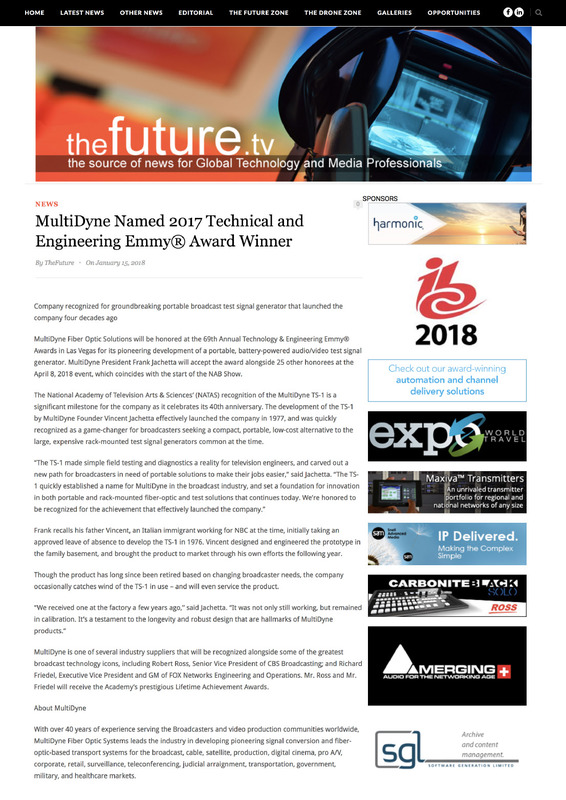 MultiDyne Fiber Optic Solutions will be honored at the 69th Annual Technology & Engineering Emmy® Awards in Las Vegas for its pioneering development of a portable, battery-powered audio/video test signal generator. MultiDyne President Frank Jachetta will accept the award alongside 25 other honorees at the April 8, 2018 event, which coincides with the start of the NAB Show. The National Academy of Television Arts & Sciences’ (NATAS) recognition of the MultiDyne TS-1 is a significant milestone for the company as it celebrates its 40th anniversary. The development of the TS-1 by MultiDyne Founder Vincent Jachetta effectively launched the company in 1977, and was quickly recognized as a game-changer for broadcasters seeking a compact, portable, low-cost alternative to the large, expensive rack-mounted test signal generators common at the time. Frank recalls his father Vincent, an Italian immigrant working for NBC at the time, initially taking an approved leave of absence to develop the TS-1 in 1976. Vincent designed and engineered the prototype in the family basement, and brought the product to market through his own efforts the following year. Though the product has long since been retired based on changing broadcaster needs, the company occasionally catches wind of the TS-1 in use – and will even service the product. MultiDyne is one of several industry suppliers that will be recognized alongside some of the greatest broadcast technology icons, including Robert Ross, Senior Vice President of CBS Broadcasting; and Richard Friedel, Executive Vice President and GM of FOX Networks Engineering and Operations. Mr. Ross and Mr. Friedel will receive the Academy’s prestigious Lifetime Achievement Awards.